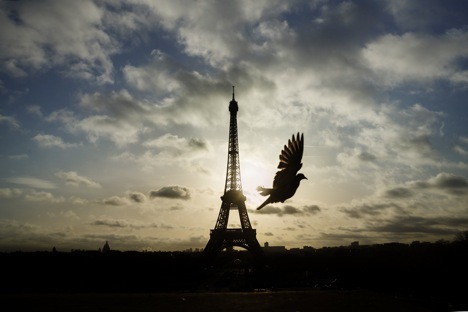 A bird flies in front of the Eiffel Tower ,which remained closed on the first of three days of national mourning, in Paris, Sunday, Nov. 15, 2015. The Paris attacks have shocked the globe and left world leaders stunned. But the small step needed to unify Russia and the West in the fight against ISIS might prove to be too much of a giant leap. In the wake of the terror attacks in Paris, it is becoming a moral imperative in the eyes of almost all normal people that the civilized world must unite in the fight against radical Islam. However, in the cold light of day, this quite understandable emotional outburst runs into formidable obstacles when it comes to Russia’s complex relationship with the West. What is hindering the formation of a new "anti-ISIS" coalition? Lots of things, unfortunately. From the Russian perspective, the most obvious is Western sanctions over Ukraine. However, many people in Russia think that there has never been a more opportune moment to overturn them. The “reason will prevail” sentiment is gathering momentum across the Russian ideological spectrum. If the Kremlin feels that Europe is indeed close to decisive action, it is possible that Moscow will try to nudge its partners in the right direction by abolishing Russian counter-sanctions, for instance, or demonstrating solidarity in some other way. However, if fear of ISIS and desire for revenge are to overpower the European political elite’s sense of self worth, something more than the Paris attacks needs to happen. It appears that the EU’s principled stand and condemnation of Russia’s actions in Ukraine will not become a bargaining chip in the fight against ISIS. In any event, politicians who are constrained by past rhetoric and unable to change tack without severe reputational damage cannot use this strategy. This means that only Russian President Vladimir Putin can initiate a drastic reversal in Russia-EU relations. Putin’s key advantage is that he is far less tightly bound by postulated principles and moral sermonizing than the Europeans. During his tenure, the Russian president has constructed a political reality in which he himself defines what is moral and what is amoral, where the line between good and evil lies, and what Russia’s national interests are. Therefore, only Putin has the capacity to change the modus operandi of Russia-Europe relations by sacrificing some asset — like a chess grandmaster who sacrifices a piece before unleashing a devastating combination (indeed, Putin has a reputation for unexpected “gambits”). However, there are limits here too. Moscow will not return Crimea to Ukraine for the sake of anti-ISIS unity, even if terror attacks rage across Russia from Kaliningrad to Vladivostok. Another aspect to the problem of creating an anti-ISIS alliance is the situation inside NATO. This situation is no less complex than the one surrounding Russia-EU relations. A large question mark hangs over U.S. leadership and willingness to lead its allies in a ground operation against ISIS. A major new military campaign in the Middle East is certainly not how U.S. President Barack Obama would like to see out his presidency. Incidentally, the climate change conference due to be held in Paris in late November (which until recently was high up the U.S. foreign policy agenda) is now also in jeopardy. If one recalls the wait-and-see attitude that Obama has adopted in all previous international crises, it is difficult to suppose that this time he will behave any differently. All that can be expected from the present U.S. administration is a strengthening of security measures, new supplies of arms to the anti-Assad opposition in Syria, and words of encouragement for Europe in its fight against ISIS. That, incidentally, could correspond to the objective interests of the United States, since in contrast to 9/11, the country is not at the epicenter of events. The article is abridged. Read the full version at Russia Direct.